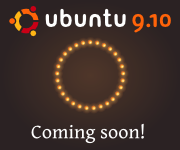 Ubuntu 9.10 will be released in 4 days’ time. So, be patient! The Release Candidate versions are, however, currently available for download if you wish to test them out. In this version, there is a host of new features. Firstly, in terms of boot up, the performance has shown in some tests, that it took much shorter time. Thanks for the enhanced Upstart script written by Scott James Remnant. With UbuntuOne integration, Ubuntu users can use the service as a storage server and share files with fellow Ubuntu users. 2GB of storage is given as a default. The service allows synchronisation of files, contacts and Tomboy notes across all Ubuntu computers and the Ubuntu Cloud. If you require more space, additional storage is available at a monthly subscription charge. Another welcoming move is the inclusion of ext4 filesystem in Ubuntu 9.10, enabled by default. Upgrading from ext3 to ext4 is possible. However, maximum performance will typically only be achieved on the new filesystems (i.e. not on filesystems that have been upgraded from ext3). With several other new features, I cannot help but look forward to the official release of this operating system. This entry was posted on Sunday, October 25th, 2009 at 6:00 am and is filed under Beta, Development Software, Fun Stuff, Linux, Site News, Software Companies . You can follow any responses to this entry through the RSS 2.0 feed. You can leave a response, or trackback from your own site.